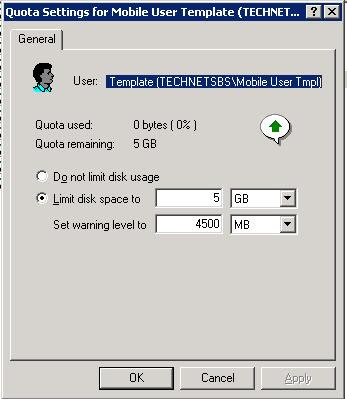 Out of the box, SBS gives every user a 1GB data limit on network shares which includes My Documents redirected ones. The exception to this rule is the domain admin account that has unlimited storage available to it. Once we have the second phase of the SBS setup finished, we will go in and modify the Quota limits for the templates before adding users in the To Do list. This way we are not fielding a call from a user wondering why they cannot move data in their system. Remember, the Quota also includes their redirected My Documents content! In most cases, we have a minimum of 300GB of redundant storage for even the smallest organization, so we tend to move the basic user Quota based on the type of organization we are dealing with. To do that, click the "Quota Entries" button for the drive that has the company shares and user's My Documents redirected to. Note the three entries for the default SBS User Templates. Do this for the default templates plus any custom templates that you may have created. This process makes the changing of a user's quota a very quick one. 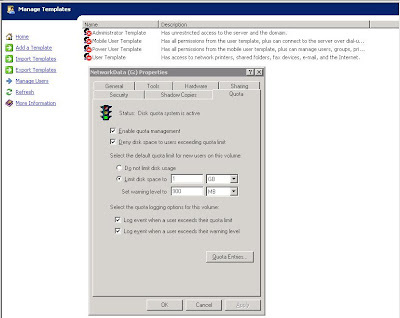 Now, all one does is run the "Change User Permissions" Wizard from Users Management and reapply the now quota adjusted template to that user. If one has five or ten users nearing the limit, running the Change User Permissions Wizard is a lot quicker than manually making the changes in the Quota Management Console!